When a recently-widowed Canadian man dining alone picked up the tab for a couple sitting nearby last week, he never expected his act of kindness to go viral. But someone snapped a picture of the sweet note he left explaining why he’d taken care of the bill, and when the photo made its way to Reddit, it quickly spread, touching people around the world. 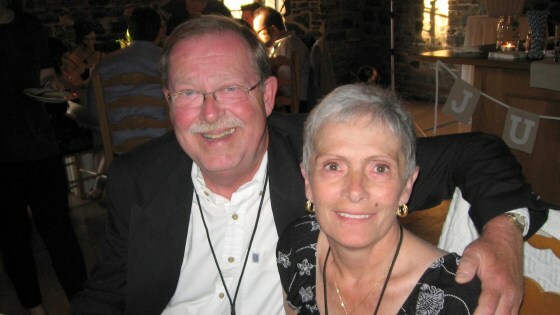 Lee Ballantyne, 65, of Barrie, Ontario lost his wife, Carol on December 30th. He was eating by himself at local restaurant Cicco’s when seeing the couple next to him reminded him of his late wife, which inspired his spontaneous act of generosity. “I just wanted to write what I felt at the time so I scrawled it on a napkin,” Ballantyne told TODAY.com. Ballantyne handed the note to the waitress and asked her to put the couple’s bill on his credit card before leaving. The waitress asked Cicco’s owner Lindsay Weiss to help her present the unexpected gesture to the diners. Weiss said the reaction was emotional for everyone. “They [the couple] were beyond touched and grateful. I cried. The waitress and chef cried. It was one of the kindest gestures I’ve ever witnessed,” Weiss told TODAY.com. Ballantyne was surprised to get a phone call later that evening from the diner who’d received his note. The man thanked him for the meal and expressed his condolences, and said he and his wife would like to take Ballantyne to dinner in the near future. Several Cicco’s staff members posted the note on social media to spread news of the good deed, and in just a few days, it had spread across the Internet as hundreds of thousands of people were moved by Ballantyne’s act. “It was just a simple gesture and it seemed like an ideal time to do that. I guess I had a selfish motive, I wanted to make myself feel good. And it did for a while. It still does,” Ballantyne said. Carol, who was 62 when she died, had experienced several health problems in recent years. She was diagnosed with lupus and fibromyalgia five years ago, and suffered from chronic bowel obstructive disease, which required her to be fed intravenously for more than a year. In October, facing lung cancer, she chose to undergo chemotherapy treatments but her immune system was not strong enough to handle them. Lee and Carol had three sons and five grandchildren. The family was astounded by how quickly the photo of Lee’s note spread online, where it has been viewed over 800,000 times, prompting news stories across the globe. Ballantyne says the family is grateful for the opportunity to share Carol’s memory with the world. “My wife’s strength and joy of life is now known to millions of people just because of that gesture so I accomplished something there. I’m glad people got to know a little about Carol,“ Ballantyne said.